"I like GoDaddy.com and I admire Bob Parsons, his 'bigger than life' personality and panache reflecting on GoDaddy, so it’s not personal, it’s business," one disgruntled critic wrote. He had invested in the GoDaddy Cashparking scheme but when he saw the cash disappear he realised something was not quite right. He was concerned by the lack of 'plain words' in GoDaddy's terms of service, such as the 'other similar methods' in relation to what type of traffic GoDaddy 'allowed'. A definition that could accommodate virtually anything; and was meant to. GoDaddy's pays out in three monthly cycles and this can lead to abuse of the cashparking system - by the registrar itself. In the above case several thousand dollars had accumulated but was destined to remain in GoDaddy's deep pockets. The advertising revenue was invalidated by GoDaddy - 'siezed'. Or so he alleged. His advice: avoid Godaddy Cash Parking. But can uncertainty be part of a Bob Parsons masterplan to even greater wealth? After all, Parsons can recall his war service years with such startling clarity - thirty years on - that such an accusation must fail to impress. Here's just a few snippets of what the founder of GoDaddy has posted about his 'days' in Vietnam. "I can remember arriving on that hill in the middle of nowhere. The night prior, the squad I was newly assigned to had been ambushed and most of them were killed. It wasn’t that moment I got afraid. Later that night I sat on this wall of an old French fort and looked into this valley and thought – this is it…I’m going to die here and I accepted that and from then on I was OK.... From the next day on, my only goal and I mean my only goal, was to simply make it to mail call. I figured that I would take small steps, tie them together, and it would get me to the finish line and that thought is what I use today to make GODADDY successful – simply get to the next day." So that's it, in a nutshell... Or is it? Bob Parsons enlisted in the US Marine Corps in 1968. He arrived in Vietnam, in his words, 'by late February 1969'. However, Delta Company rosters record that "Parsons, Bob, R" commenced his tour of duty at the 1st January 1969 - seven weeks before the date he claims. On February 22, four Delta Co marines were indeed killed and six more wounded. If the rosters are correct then the 5-week stint followed a rather inactive period for Delta Company: and for Bob. The events are said to have influenced Bob's life forever. He was apparently later medically evacuated from Hill 190 after being wounded at Quang Nam - in the buttocks - five weeks after arriving there. Or should that be five weeks after he claims he arrived there? But TheBigRetort ventures too far into the enemy's paddy fields, on what is essentially a dark night, so back to domain basics. TheBigRetort's first article in the GoDaddy Series was last seen comfortably sitting on the second page of Google, which is not too bad for a tiny English blog more accustomed to rocking the boat in Dear Old Blighty than across the Pond in the Americas (where it is also read). But now, according to a recent Google search, it is almost rubbing shoulders with GoDaddy itself. "84% of searchers never make it past the bottom of page two of search engine results. Just think about this for a moment. Imagine the web is one giant city, with stores scattered through it. Having your site in the top 10 is like having your store right on Main Street or near the entrance of the largest shopping mall in human history. Being outside the top 20 is like having a corner store on the outskirts of town." Our previous expose revealed that GoDaddy founder B-O-B P-A-R-S-O-N-S (the marine with the ring) pocketed $1.6 million in advertising revenue from parked pages - it beats working for a living - and many of the domains belonged to people who had purchased them from the Baltimore Bully himself. GoDaddy offered the opportunity for one and all to share in its revenue success via its new CashParking scheme - at a price, naturally. TheBigRetort snook a little look at what Daddy was up to: and was not that impressed. "Earn up to 80% of ad revenue" boasted its CashParking Plan. GoDaddy keeps the other 20%. Oh, and don't forget... you must also pay for the right to use the CashParking plan too. Does the phrase MONEY FOR OLD DOMAINS spring to mind? When TheBigRetort invested in the scheme the revenue generated from its rather sizeable portfolio remained no more than a trickle. And what cash did come our way suddenly - and inexplicably - disappeared. The domains had done a Houdini. Alongside approximately $20 that also vanished from the CashParking account. We decided to find out what had happened. To recap... GoDaddy previously accrued $1.6 million in advertising revenue from 'parked' domains: for itself. It did not share this revenue with its customers. 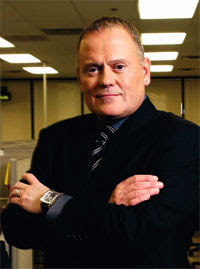 TheBigRetort wanted a few nuggets of wisdom from Bob Parsons himself. We wanted to know if any other customers were as lucky as he. Double-Dutch. However, when GoDaddy then responded (eventually) that this was not in fact the real problem we wondered if we could smell 'vagueness'. The two domains it transpired had been completely removed. GoDaddy was suddenly threatening to close down 'the entire' Cash Parking account. It explained why: "These determinations are not made based on the amount of traffic that comes to your domains. The amount of impressions to your domain(s) is not a determining factor by GoDaddy or Google. It is not permitted for you to routinely click on your own links in the Cash Parking system." 'Routinely click'? 'On our own links'? Apparently CashParking is designed to share the revenue generated on domains based on (i) Accidental Traffic; mistypes, etc., or, (ii) Residual Traffic; domains that have undergone a change of ownership. This usually happens when a registrant forgets to renew, and then the person who lifts the domain steals his traffic; which is a rather astonishing and immoral concept. GoDaddy was confidently stating that it was okay to earn money out of other people making typing errors - accidental traffic - or by 'passing off' as the longstanding owner of a previous site. Although many punters believe that the 'residual' traffic becomes theirs by default this is not always the case. Some purchasers suddenly encounter empty space with no old links to the domain name. Indeed TheBigRetort has so far concluded that much of GoDaddy's cashparking 'revenue' is based on the naivety of the purchaser (its customers), and is also one-sided. Conveniently allegations of clickfraud, often unsubstantiated, lead to expulsion; with retention by GODADDY of the revenue raised. But what domains had been 'routinely clicked' in our portfolio and by whom? "The most common problem leading to a determination such as this is the Click Through Rate (CTR), or the percentage of clicks vs. total impressions to your domain. This is a fairly accurate way to determine if the behavior of the impressions to your domain is consistent with what Google would determine as "natural behavior". We find that natural human traffic will result in Click Through Rates (CTR) of no more than 40% on sites with more than 1 or 2 visitors. CTR's significantly or consistently higher than that are usually indicative of incentivized clicks, click groups, or software programs designed to simulate click traffic." What 'click groups'? Could we see a report? "We are unable to provide full reports on the statistics that caused these traffic patterns. Unnatural traffic is defined as traffic that any given domain may see when not advertised, or targeted. Normal traffic does not generally cause the amounts of traffic we see on your domain name, thus is considered to be unnatural and provoked. Residual Traffic tends to taper off after a period of time where as incidental traffic traditionally does not have high click through rates. In this instance the domain does not fit into either category as the traffic appears to be steady and excessively high." According to GoDaddy rival competitors can also click on a competitors ads in order to undermine his or her campaign and exhaust their budget. So, no advertising at all - which means no BIG bucks. "This includes clicking on your own links. As a result, your Cash Parking service has been permanently suspended. Our regulations are in line with those of Google. As Google will not be providing revenue to us for what has been deemed to be unnatural traffic, we will not have any revenue to share with you." But hadn't Google already paid GoDaddy a bundle of cash? "Please be aware that our founder and CEO, Mr. Parsons, is extremely busy with his vast array of duties and thus is not able to personally reply to emails sent to our office given the amount of correspondence. As you may already know our President and COO is Mr. Adelman. Mr. Adelman reviews all messages delivered to this address; due to the volume he is unable to reply personally. However, at his discretion he may opt to do so or add to the comments of our office." It added, "Unfortunately for security purposes we cannot discuss the methods used to monitor this traffic, and this includes the information found on the domain names in question." Sent to Guantanamo; without trial. Beaten by the 'evidence'. The GoDaddy jury had finally reached its verdict; however vague. Meanwhile, in the Cashparking pages themselves, the message could not have been more clear: "Domains not allowed due to fraudulent activity".